ObiJan Technologies: Darn! I got ripped off! Yesterday night, a shy looking teenage girl rang my door. According to her, she was collecting donations for a childrens's hospital, any donation that I could make would help her school out and would be well appreciated. Somehow, the professionally amateurish "pitch" made me cave in. I donated $40 cash. She asked if I would like a receipt for tax purposes. I said "Yes". Later, I took a closer look at the "tax receipt" she gave me. That's right folks, the old saying "no good deed goes unpunished" still holds true. Apparently, somehow, I was signed up for a "magazine subscription". Lord knows which one, as the girl never mentioned the word "magazine" to me. 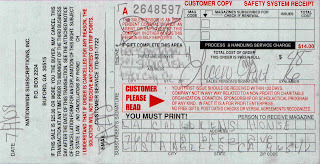 The "receipt" itself showed very little detail, except for a "customer support" number, which I promptly called. Which did not work. My next action was searching for that number on google, which turned out a multitude of complaints and "scam warnings". Luckily, I donated in cash, not by cheque. I know perfectly well that the $40 is gone forever, my only concern is the sleazy company trying to imply that I somehow subscribed to their magazine, and this $40 was registered as $48 (see picture) "first installment" payment. Then again... let them come! With no signature on file and my name spelled incorrectly on a barely readable scrap I suspect that they will have a hard time holding it up in court. Side note: she promised to come by in a few days to drop off a "thank you" note. I doubt that she will, but if it happens I will post updates (and hopefully pictures) of our "animated" conversation. Be very careful when somebody comes to your door. Always ask for documentation, and tell them you will get back to them. Most legit companies will be happy to comply. Needless to say, I won't be donating anything to anybody any time soon any more.